One thing I envy about high-end modern furniture is that often pieces are designed to accommodate modern technology. 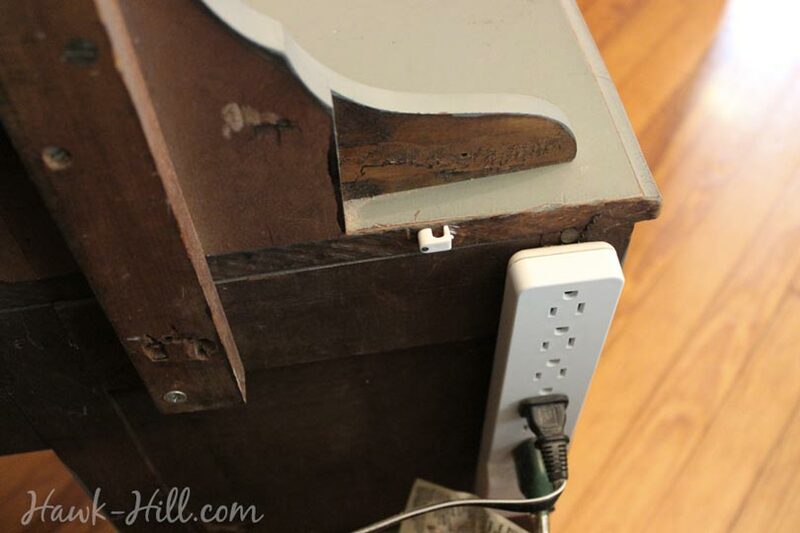 Being a fan of vintage furniture, I assumed these worlds: tech-friendly furniture and vintage styles, would never meet- until I began experimenting with this DIY solution to add a hidden retractable phone charger to the back of the 1920’s vanity I use as a bedside table. I hate how cords and adapters lying around make even a clean room look untidy- so I developed this methods for using basic, cheap hardware to create a retractable phone charger that fits basically any dresser, bedside table, or night stand- even vintage ones! Read on to see how I created this disappearing phone charger! Cable clips are these cute little nail-in cord holders that are ridiculously cheap and super handy to have around. Get them here. For this project, you’ll want to use a cable clip larger than the diameter of your USB cable- since the point is for the cable to slide freely through the clamp. 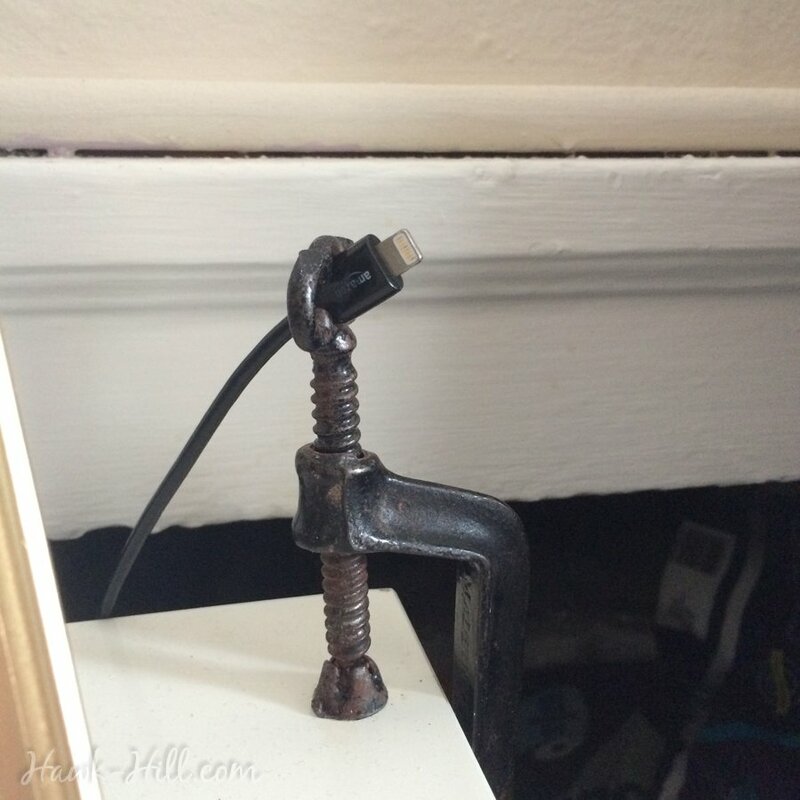 To begin, install cable clip with a hammer on the back of your nightstand or dresser, as shown. (For a tough piece of furniture you should be able to nail it right in- for antique items use a tiny drill bit to drill a pilot hole for the nail and then gentle tap the nail into pace) Make sure you install into a piece of solid wood rather than a veneer or thin fiberboard backing. This clip will serve as a “holster” for the charger plug when the cord is retracted behind the dresser. Attach at the very top, where back panel meets top of dresser. Leaving about .25 inch between the top of the clip and the table top- so that if the clip is twisted, it comes up over the top of the table, allowing access to the hole. Grab your washer, it’s time to attach a counterweight to your cable. This weight will pull the cable back behind your dresser and out of sight when not in use. I used big washers (I ended up only needing one) but there are probably lots of ways to add a counter weight, just be sure that your washer (or whatever you use as a weight) is about the same weight as your phone (otherwise it could pull your phone right off the table!). I put my cord through the opening in the washer, and then looped the cord so that the washer would not slide wildly up and down the length of the USB cable. And twist the cable clip into horizontal position, behind your dresser. The cable should move up and down through the C clamp freely. Step 4. Align Cord, Plug In, and Use! That’s it! Just make sure your weight hangs freely, and is sized right for the weight of your phone, and this quick method for installing a retractable phone charger on your nightstand is complete! Your setup should look something like this (minus the power strip). Installed correctly, the weight hangs freely behind the nightstand and holds the phone charger just out of sight until needed, keeping table tops tidy. A phone charger holstered by a cable clamp is retractable and always easy to find. A vintage C clamp works great as a USB cable holder, and can be adapted using these instructions for creating a retractable phone charger. I had the same idea as you because I have a bunch of the same cable clips (white, with nail built-in) as you, but didn’t like the fact the cable wouldn’t be retractable. I thought of all these (relatively) complicated solutions for that but your counterweight solution is best and hadn’t occurred to me at all, apparently because I’m only able to envision unnecessarily convoluted solutions apparently . So thanks! Great idea! Thanks so much for publishing this idea along with the excellent illustrations. Now I can get my countertop cleaned up. It’s amazing! You are very cool! Thank you for good idea!